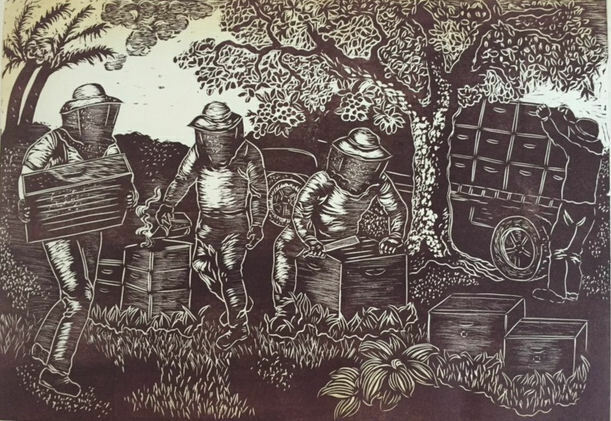 In this woodcut print the beekeepers tending their hives in the wilelaiki thickets of Kohala go about the routine activities involved in maintaining healthy honeybee colonies. The second beekeeper from left is smoking a hive to calm the bees so he can open the hive without getting stung. The third beekeeper has just pried the lid off a hive and will lift out the frames examining development of the honeycomb, the location and state of the queen and looking for the myriad of subtle clues that tell the story of how the hive is functioning. The first beekeeper is carrying a hive loaded with honey to the truck, where they will transport them to the warehouse for harvesting. It is essential that the hives are checked and treated regularly to ensure that the bees are healthy and the predatory varroa mites and hive beetles are under control. These pests, which were recently introduced in Hawaii, make it almost impossible for honeybee populations to exist in the wild, because the bees cannot control these pests without help from humans. “The Beekeeper” is in homage to the 1568 drawing of the same title by Dutch artist Pieter Bruegel. Scholars have analyzed this mysterious drawing of three beekeepers and a boy in a tree, indicating that it refers to the conflict between the Catholic and Protestant churches. In this Hawaiian version I recreated Bruegel’s distinct composition and added modern day implements and technology. The tree is modified slightly to evoke the wilelaiki tree. Some scholars believe the foreground plant in Bruegel’s image is an indigenous plaintain, which I transformed into the endemic Hawaiian plantain, kuahiwi laukahi, which is endangered. The palms in the upper left corner are a feature of the Kohala wilelaiki bee yard. This is a multiple-block original woodcut printed on a handmade paper. To learn more about Big Island Bees visit bigislandbees.com.